The Chicago-bred multisaxophonist Charles Davis had a long and distinguished history before he ever set foot in Smalls, but while there he penned another distinguished musical chapter in his storied career and his influence is in no small part what helped make Smalls the authentic ground for musical development that it is. Of the previous chapters of Davis� career, there are too many to even summarize here, and nearly as many that are too important to omit. He played in some of Sun Ra�s first breakthrough ensembles, appearing on numerous records including the legendary Interstellar Low Ways (Evidence 22039). He played with Ben Webster, Billie Holiday, and Dinah Washington. He played and recorded with Kenny Dorham (see for example Jazz Contemporary, Stereo Time ST2001). He performed and recorded with Elvin Jones and Jimmy Garrison on the brilliant Illumination! (Impulse IMPD25). In 1964 he won Downbeat Magazine's International Jazz Critics Poll for the baritone saxophone. He has been often heard in the company of Cedar Walton, Sam Jones, and Billy Higgins, perhaps one of the greatest rhythm sections that ever took the bandstand. He made television appearances with Archie Shepp, Lucky Thompson, Ossie Davis, and Ruby Dee. He toured with the Clark Terry Orchestra. He performed and recorded with the Freddie Hubbard Orchestra (see The Body and The Soul, Impulse IMPD183), with the Philly Joe Jones Octet, and with Dameronia (see To Tadd with Love, Uptown UP27.11 and Stop Look and Listen, Uptown UP27.15), and with the Clifford Jordan Big Band. He�s been a featured member of the Barry Harris/Charles Davis Quartet for more than a decade. He�s recorded under his own name several times -- see for example Ingia! (Strata East, 1974), Dedicated To Tadd (West 54, 1979), Super 80 (Nilva, 1982), and Reflections (Red, 1990), and most recently on the widely acclaimed Blue Gardenia (Reade Street Records, 2003). I could fill the rest of two pages with a list of names that Davis has performed with, with projects that he�s been associated with, and with various other accomplishments in other areas such as acting. But all of that is a matter of record, and to recite it would not convey the important sense in which we--we at Smalls--know Charles Davis. The New York that I remember from youth (70s, 80s) was a place where there were too few jazz clubs, and where you couldn�t afford to go to any of them. The racist cabaret laws restricted brass and drums to only a few licensed venues. If you wanted to know what was really going on, you had to find your way into the inner circle of cultural institutions such as private spaces, and not-for-profit centers such as The Jazz Cultural Theater, or The University of the Streets. When the cabaret laws were overturned in 1988, the jazz scene began to blossom, bringing a multitude of small new clubs. For the first time, the real body of the New York jazz scene began to be revealed in its entirety. Originally, I knew of Charles Davis mainly, as many listeners did, from his beautiful baritone feature on his original composition �Half and Half� on Illumination!. Though he appeared around town at the high priced clubs, I couldn�t afford to see him. When Smalls arrived, though, suddenly ten dollars would get you twelve hours of music, and appearing nightly were the great artists known hitherto mostly within the inner circle of the New York jazz world. For several years, every Saturday night, you could go to Smalls at 3am and hear Charles Davis featured as a part of the Frank Hewitt group, which included Frank�s working trio with Ari Roland and Jimmy Lovelace, featuring Charles Davis and the great trumpeter Joe Magnarelli out front. And this is where a generation of young musicians first got to know about Charles Davis. What you quickly come to understand about Charles is that he is an artist of both scope and depth. He is there in the roots of the avant-garde having played for many years with Sun Ra. He is there in the hard bop sessions of the fifties. He is there in the Coltrane and post-Coltrane styles of the sixties. And he is here now. He exemplifies the best in all of these styles, and he lays to waste the very idea that these represent conflicting factions, and instead shows us decisively that there is a transcendental continuity in jazz. He has a romantic spirit, but his playing is never trite, and it truly reflects a lifetime of experiences with one�s eyes wide open, even throughout the most tumultuous of times. When he speaks with his horn, his musical poetry has an authoritative and authentic voice. I think it is very important for younger players to take note, so they may better understand the kinds of expression that jazz was fashioned for by its originators, because it is something over and above the mere idea of extemporaneous composition. 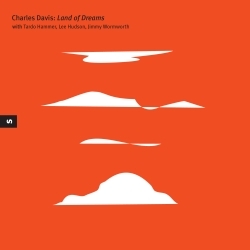 The title of this record, Land of Dreams, comes from a tune of the same name that was played often in sessions in Chicago in the 1950s, and is now featured here. Based on the familiar �Cherokee,� the A section was written by Eddy Heywood with the bridge being composed years later by Charles Davis. I have a personal fondness for Charles� original tunes such as the elegant �Strangeness� included here. I hope our next project will document more of his beautiful compositions. The producer would like to give special thanks to Debbie Millman, Jeffrey Brown, Tom Currier, and Marcy Granata for their gracious assistance in making this recording possible.